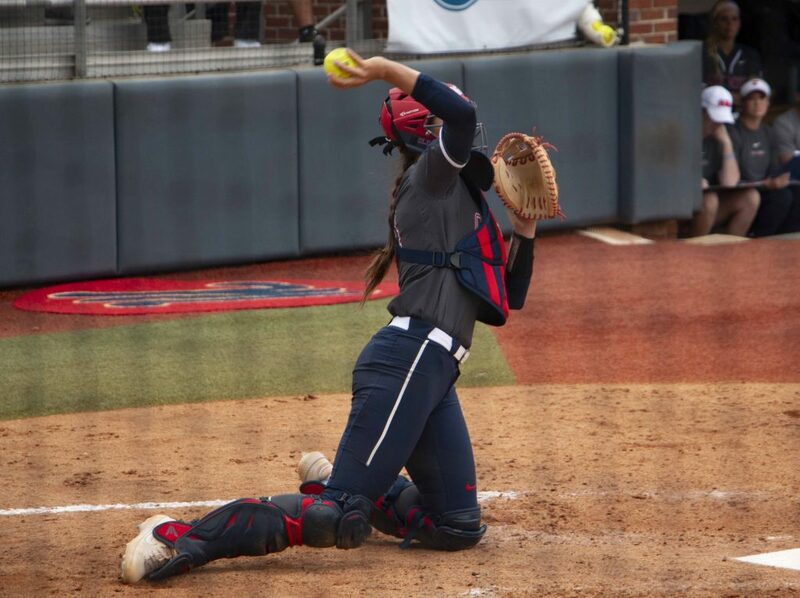 Ole Miss softball did not complete its first sweep of the season but was still able to take the series from Missouri for the team’s fourth series win this season. The Rebels took both games in the Friday night doubleheader. They won the first game in eight innings with a 2-run walk off home run from Brittany Finney. Finney started the game on the mound and pitched 5.1innings, giving up 5 runs and 6 hits while striking out five. Molly Jacobson took over and pitched 2.2 innings, striking out two to earn the win. 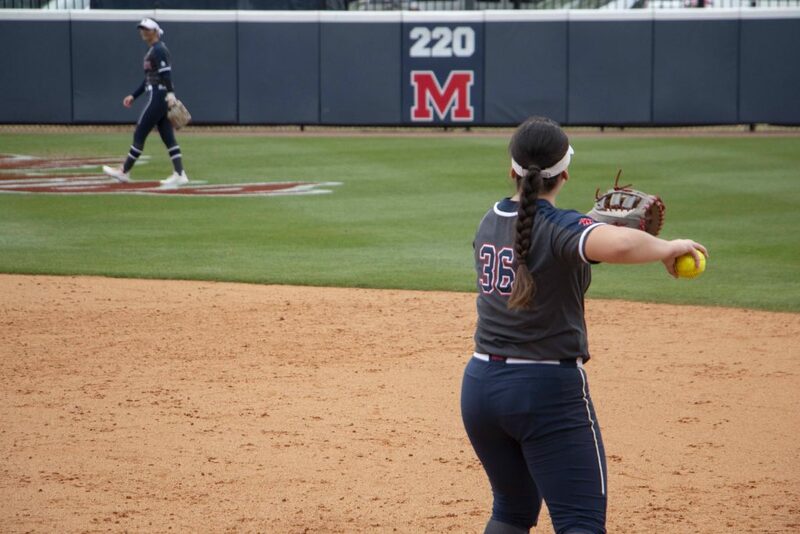 Ole Miss player Gabby Alvarez throws the ball to a teammate at the series against Florida earlier this season. The Rebels won the first two games against Missouri this weekend but lost the final game. Photo by Katherine Butler. Amanda Roth kick-started the offense with a double to open the third inning. Kylan Becker was next on base drawing a walk. Roth scored later in the inning from an RBI single from Abbey Latham. Latham was thrown out trying to advance to second but scored Becker in the attempt. In the fourth inning, Gabby Alvarez drew a bases-loaded walk to bring home Katelin Cooper. With the bases still loaded, Becker stepped up to bat and hit a 2-RBI single to bring the Rebel lead to 5-0. The Tigers didn’t go away quietly, tying the game in the sixth inning. With neither team able to get on the board again after seven, the game went into extra innings, the sixth time Rebels have gone into extra innings in their last ten games. Finney was able to win the game for the Rebels with a walk-off 2-run shot to take game one. The bats weren’t as hot in game two, but strong defense and pitching helped the Rebels win. Hits and earning her 12th win on the season. Finney batted in the only run for the Rebels in this game. She doubled down the line to score Autumn Gillespie in the second inning. Finney finished her weekend at the plate with a double, a home run and 3 RBIs. The Rebels dropped game three 2-5 to lose the sweep. Ole Miss took the lead first by loading the bases from singles by Alvarez and Roth and a walk from Becker, but a 5-run fourth inning for the Tigers was too much for the Rebels to come back from. Pinch runner Kacey Hvitved was able to run home on a wild pitch, but Ole Miss left its other runners stranded. Latham drew 3 walks and walked in a run in the sixth inning to drop the Tigers’ lead to three, but Ole Miss failed to capitalize on the situation again and stranded the runners. Ole Miss left 12 runners on base, tied for the most in a game this season. The Rebels were also able to draw 11 walks, the most in a game since 2017. With this series win, Ole Miss now has four series wins this year, a program record. The Rebels still have three series left in the regular season and will travel to Starkville next weekend to take on Mississippi State. Before Ole Miss faces the Bulldogs, the team will have a midweek matchup against UT Martin at 6 p.m. Tuesday in Oxford.